Roy Hodgson's joy at keeping Fulham in the Premier League was tempered with sympathy for Birmingham boss Alex McLeish and Reading's Steve Coppell. The Cottagers' 1-0 win away at Portsmouth was enough for them to avoid the drop, despite impressive victories for their relegation rivals. "I know exactly how Alex McLeish and Steve Coppell are feeling," he said. "I am good friends with both of them and I feel sorry for them because going down is a horrible feeling." Fulham were contemplating life in the Championship until Danny Murphy's 74th-minute header secured their place in the top-flight for next season. It meant Reading's 4-0 win at Derby proved in vain, as did Birmingham's 4-1 success at home to Blackburn. Both teams started the day in the bottom three, with Fulham just above them in 17th place, but with Birmingham and Reading winning, Hodgson's side were in the relegation places until Murphy's late strike. 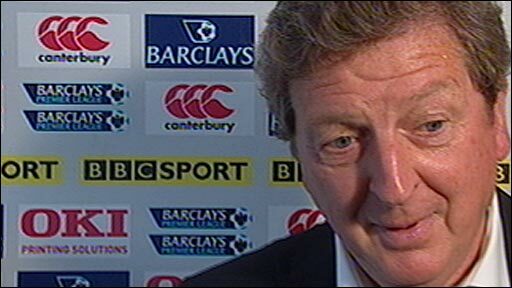 And Hodgson revealed he had started to think about life in English football's second tier. "In all the jubilation, I must say we were not that far away from it being us and not them," he said. "But it feels great, it was obviously going to be a very difficult game to win for us. Portsmouth gave their all and we knew it was going to be a tough task." Hodgson inherited a team which looked relegation certainties when he took over at the end of December. And there appeared little sign of improvement until a dramatic turnaround in the last month. He added: "You always dream you are going to go in and start winning matches straight away and by a couple of months down the road you'd be in the top half of the table. "But I think if I am realistic I understood what a difficult task I took on. "The players, quite simply - since we have decided on our best team - have been magnificent. "You read headlines that we were dead people walking and waiting for the season to end. "But we have done much better than that and done it by playing well and working hard. I don't think anyone can say we didn't deserve it." Reading boss Coppell paid tribute to Fulham despite seeing his side drop out of the Premier League. "Fulham have earned the right to still be in this league, no doubts," he said. "They have had some brilliant results recently, including at Portsmouth. "In hindsight, all we can do really is congratulate Fulham. I guess they have put a real dampener on our day." McLeish added: "We have missed out by one point. The players have punched above their weight many times this season. "People ask if I could have kept us up had I been here for the whole season? But that is just conjecture. "I now aim to bring in some more players. I've now got the chance to put my own stamp on the club." Portsmouth manager Harry Redknapp congratulated Hodgson, saying: "I think he's done a wonderful job, a bit similar to when we narrowly escaped relegation a couple of seasons ago, although Roy's got better players than I had then." Despite their narrow escape, Fulham still have a slim chance of qualifying for next season's Uefa Cup. England have clinched another berth in the competition through Uefa's fair play league, which will go to the Premier League's fairest side who have not already qualified for Europe. Manchester City currently lead the way, but information from the final two games of the season still needs to be collated by the Premier League and then audited by Uefa. City's cause was not helped when captain Richard Dunne was sent off in their 8-1 defeat to Middlesbrough. Other factors such as behaviour towards match officials and positive play are taken into account so both sides will have to wait to see who will feature in next season's competition, with a decision likely to made next week.